Happy Thursday, dear readers! As wonderful as it was having the day off yesterday to spend quality time with my family, my body is all messed up and cannot decide if it is a Monday or what is going on. Holidays in the middle of a work week are so strange! At least things have settled down a little so I could share some beauties with you. Now on to today's blog post! I had shared a blog post about my time at The Makeup Show in New York City, but then life went crazy and I've not shared a lot about what I brought back with me. One of the booths I visited was Inglot Cosmetics, and I was eager to check out the new Jennifer Lopez collaboration in person. I was definitely not the only person with this mindset, and the booth was PACKED! I grabbed the opportunity to get up and close to the gorgeous new offerings as soon as there was an opening at the booth. While there were many lovely things to choose from, my budget was limited, so I picked up a handful of fun things to try out and share on the blog. Let's get a closer look at what I bought! I don't know if I even have the words to describe just how in love I am with this illuminator! Radiant comes in a 2.5oz sifting loose powder container with a puff for dusting onto your face or body for a gorgeous shimmery glow. I prefer to use a brush to place it on the high points of my face for optimal control of the product, but the puff is fantastic for patting it onto my shoulders and collar bone. 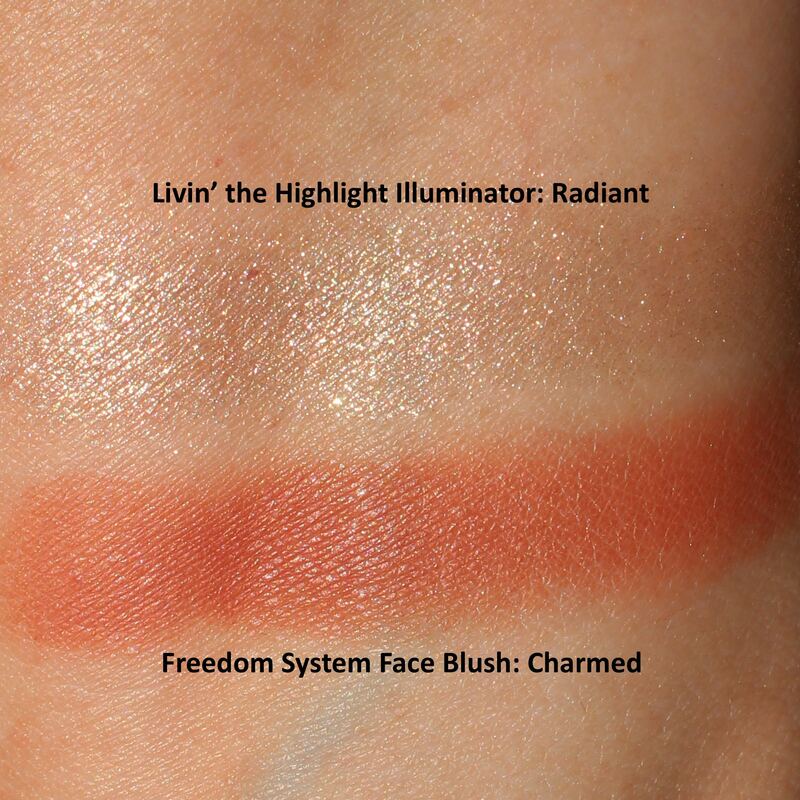 Radiant is the lighter illuminator from the JLo collaboration, and while it works nicely for me, those that are very pale may find it to be too dark for their preference. In addition to an illuminator, I picked up the beautiful Charmed blush. This blush adds a beautiful warm persimmon-hued flush to the skin. I am loving it this summer! It applies smoothly and I've not had any issues with patchy application. While I wear blush often, it is pretty unusual for me to go gaga over one; this has definitely had that effect on me! I also picked up three different lip products to try out from the Inglot Cosmetics Jennifer Lopez collaboration. Supposedly the matte lip trend is going out and shiny lips are in, but then I'm one who wears what I feel best in regardless of trend. Even at the height of the matte lip craze, I still enjoyed shiny lips, so it was no surprise that I was drawn to the beautiful Peach Pearl Lipglossy Lip Gloss. I love this shade for when I want a subtle pop of colour on my lips, and it is great for layering over lipsticks for added shine and changing up the base colour. The formula is on the thicker side, resulting in nice pigment on the lips without the sticky feeling that comes with a lot of lip glosses. 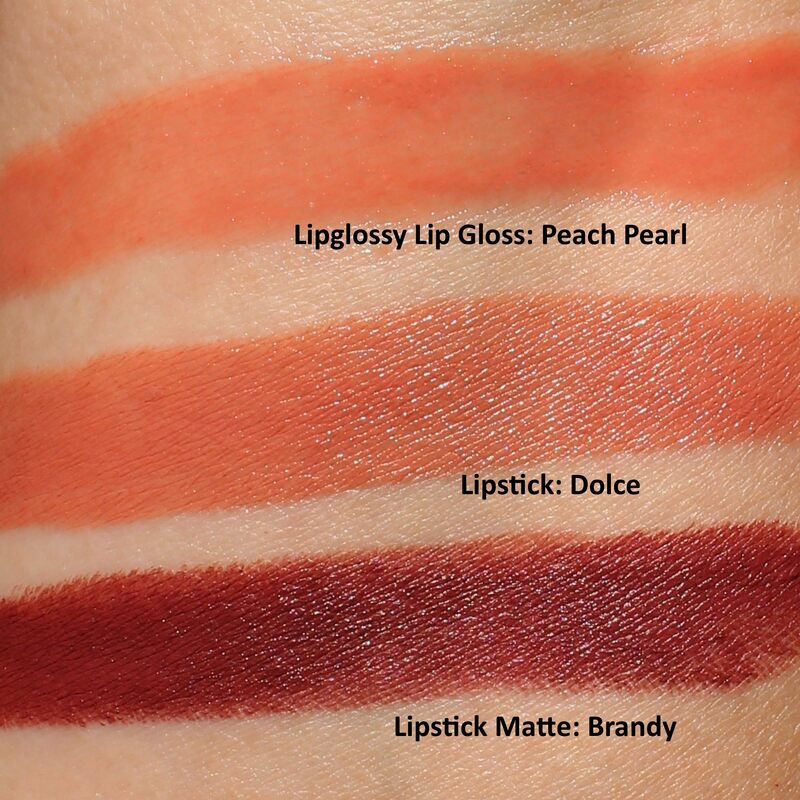 Dolce is a beautiful creamy dark peach lipstick. It applies smoothly to the lips with a nice pigmented finish. Because it is a traditional lipstick, it does come off as you eat and drink and will have to be reapplied throughout the day. While I usually wear more intense shades, Dolce has been a staple in my makeup routine since I bought it. It is gorgeous on its own, and I've actually be pairing it with Peach Pearl Lipglossy a lot! Brandy is a gorgeous muted brick shade with a matte finish. It is a nice deeper shade for in the evenings and will be something I am more likely to grab for in the fall. The only drawback to this lipstick is the bullet is very firm, and it pulls during application. This may not bother some readers, but I personally find it a little uncomfortable, so I won't wear this as much as I had hoped. A lip brush helps so it isn't as uncomfortable, but the formula is still a little drier than I would prefer. This isn't too unusual for a matte lipstick, but I thought it was worth mentioning here. Here's my go-to summer look using the illuminator, blush, Dolce lipstick and Peach Pearl Lipglossy. 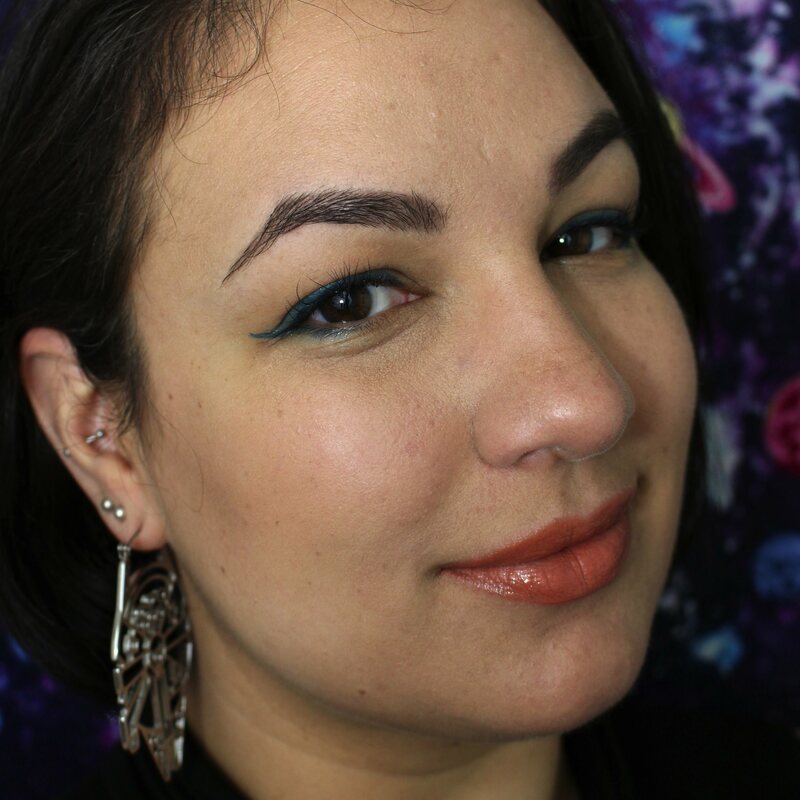 I've been digging pops of teal for eyeliner a lot as well, and I used Cozzette Cosmetics in Dioptase here. Have you picked up anything from the new Inglot Cosmetics x Jennifer Lopez collaboration? If so, what have been your favorite items? I just picked up a couple more shades to play with; let me know if you want me to share those too! I'm loving that highlighter! It's absolutely glowing! I love the lip on your in your face photo! So fun and summery. It is such a pretty highlighter, and I'm even wearing it on my shoulders, something I generally don't do! Those are perfect shades for your coloring. The lipstick looks gorgeous on you. Thank you! They have other pretty shades but I obviously picked out the ones I thought would suit me the best. I’ve been after a blush in that shade for the past two years! And also, I will continue to wear matte but I’m warming up to glosses! It's the perfect blush shade I've been trying to hunt down as well, and nothing was ever quite right. I was so excited when I saw it! I know that people are saying matte lips are going away but I love them always! Matte lips are so pretty, I don't see them going away completely! I adore the teal eyeliner on you. Thank you! It's been my go-to pop of colour this season. I really like the lip shades in this collection! There are several other really pretty ones that sadly I don't think would be flattering on me. I definitely recommend checking them out! The teal liner looks great on you. I tend to use a royal blue on myself. Its a great way to add a little pop of color. Thank you! Yes, it is the perfect way to add colour and is so easy for something quick before running out the door! I definitely want that peach lipstick and gloss. It looks fabulous on you! They are so pretty separate and together, Thank you! I love inglot! I’ve been curious about this collection, I’d love to hear what else you picked up! I've not tried a lot from the brand before, and I feel like I opened Pandora's box here, haha! I love the colors in this collab - I could totally see JLo wearing these shades herself! Everything is so warm, sunny, and glowy! They are definitely JLo shades so I wasn't surprised in the least when they were revealed. They are gorgeous! These are great colors for your skin tone! Thank you! The J Lo collaboration has so many great shades that spoke to me! Those are all real nice shades, love that highlighter! Oh, I had no idea this was a collab! These colors are perfect on you!